Controversial radio presenter and reggae musician, Blakk Rasta has apologised to Ghanaian parliamentarians for accusing them of smoking “wee”. 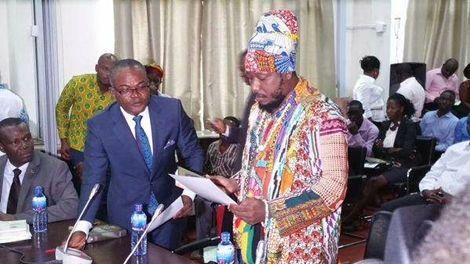 Appearing before the Privileges Committee of Parliament for his comments, a remorseful Blakk Rasta pleaded to be forgiven – “The utterances were unfortunate. They came on the spur of the moment. I was on heat…sometimes such things comes off the mind. I am really sorry about my comment.” Blakk Rasta sworn with the Quran and vowed by the name of the almighty Allah to offer an honest answer before the committee. According to him, “my intention was a passionate one to make the economy balance by legalizing marijuana”. A Member of Parliament for Efigya Sekyere East, Hon. David Henric Yeboah raised the issue on the floor of Parliament and entreated that Blakk Rasta be dragged before the House for maligning MPs; a request which was quickly granted by the Speaker. A live hearing was held in Parliament, Thursday when the Rastafarian was invited by the Privileges Committe of the august House to help clarify the allegation. He has since been discharged but awaits a final decision from the Privileges Committee, which is expected to sit and review the issue.